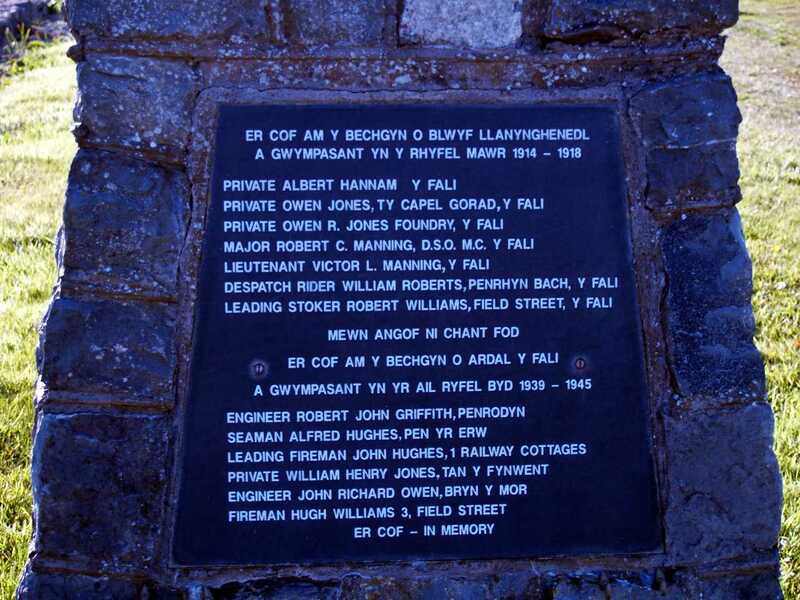 War Memorials on Anglesey in North Wales. Valley War Memorial on Anglesey in North Wales. 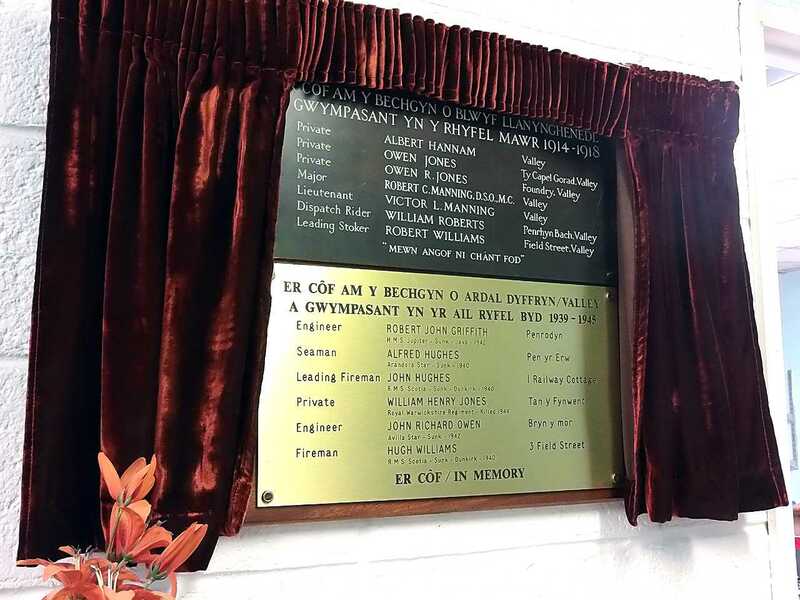 Anglesey, Valley School War Memorial Casualties Names. Private Owen R. Jones on the wall in Tabor Chapel. Anglesey, Valley, Tabor Chapel War Memorial to Owen R. Jones. Valley, Ynys Wen Cemetery WWI and WWII War Memorial Casualty Names. 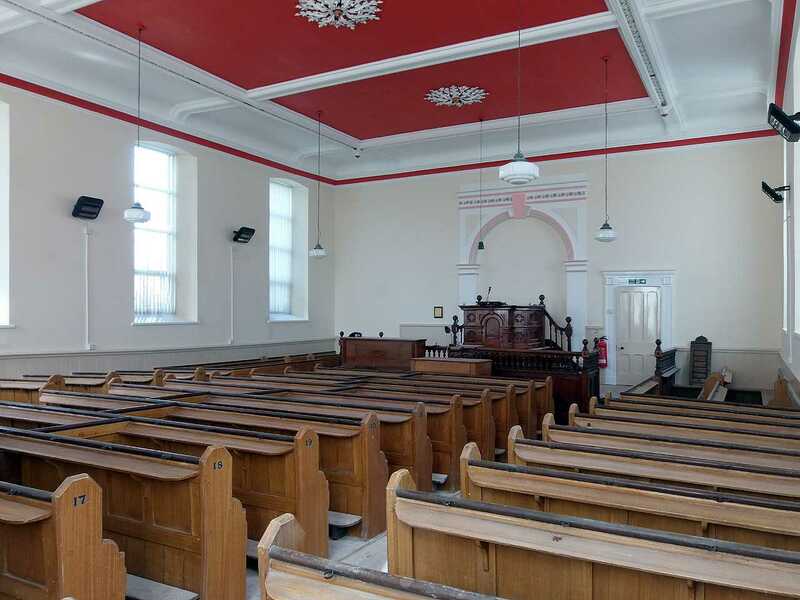 Anglesey, Valley, Tabor Chapel Interior - The memorial is to the left of the pulpit. 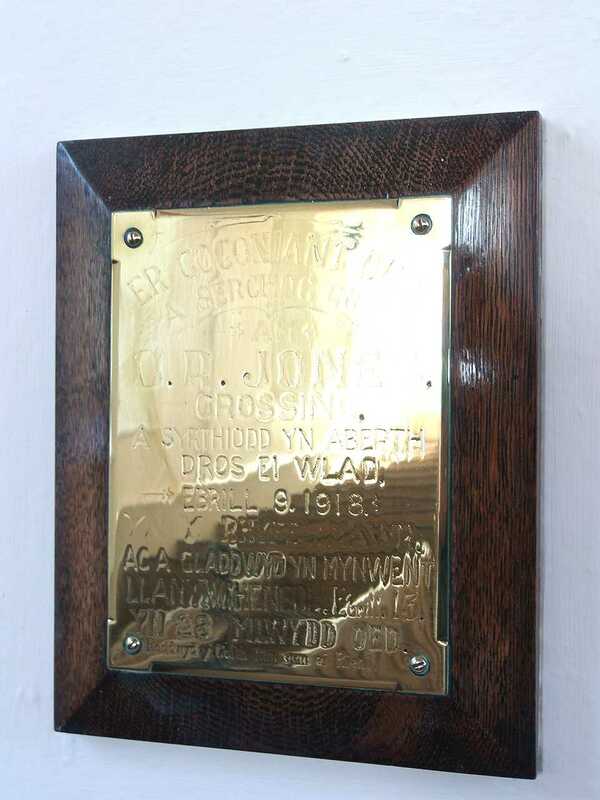 Llanynghendl Church, Private Owen Richard Jones died April 9th 1918 aged 37. The table below is a list of the casualties from World War One (WWI) and World War Two (WWII), and gives as much information as I could add, because of the scant information on the actual memorials. You may notice that Owen R. Jones is down on the memorial as a 'Private', but as I knew the exact date he died (see Tabor Chapel Memorial above), and his headstone above, I was able to find him in the Commonwealth Graves Commission database. Another mystery was that his address is 'Foundry' on the memorials, and 'Crossing' on other sources, in fact his grave shows that his address was 'Foundry Crossing', a combination of both names, and I then knew for sure that he was an Able Seaman, in the Royal Naval Volunteer Reserve. For those that might wonder how an Able Seaman could be wounded on the front in France, he was a member of the Hawke Battalion of the Royal Navy, who I know from my research experience, actually fought in France (and Gallipoli) as if they were Army. Owen was sent home from France badly wounded, and treated at Fazakerley Hospital, where he died. 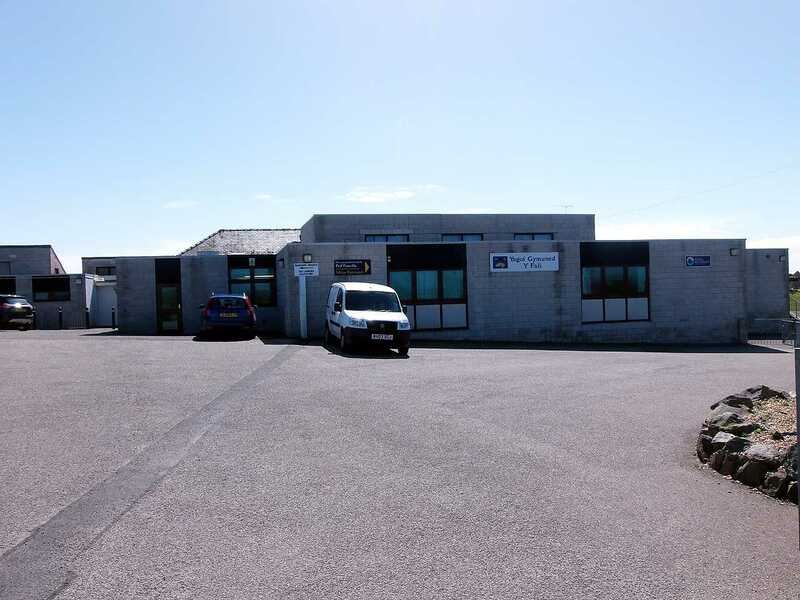 Owen was brought home to Anglesey and buried in Llanynghenedl Churchyard, where he now rests alongside his Mum and Dad. Robert Charles Manning (below) was awarded the D.S.O. and the Military Cross (second only to the Victoria Cross). His brotherVictor is also on the list. 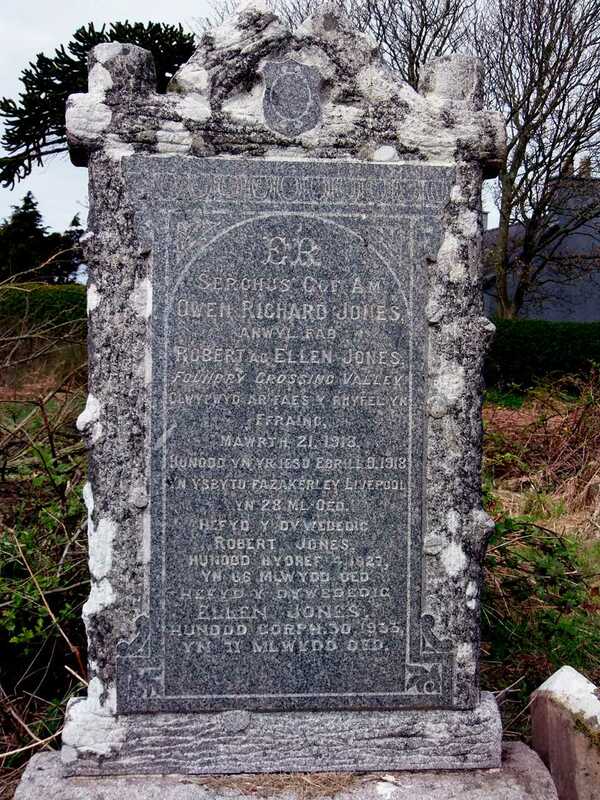 Originally from Dublin, the family had previously lived in Holyhead, which explains why the two brothers also appear on their War Memorial. They are both remembered on the grave of their parents and other members of the family in St Seiriol's Churchyard in Holyhead. Their brother - Francis Graham John Manning - who served as a Lieutenant in the Royal Navy Reserve, was awarded the Distinguished Service Cross for his part in the sinking of a German Submarine in WWI, he survived the war and lived into his late 80's. Their father, Captain Lionel John Manning M.B.E., was the captain of the Hospital Ship H.M.H.S. Anglia when she was sunk by a mine in the English Channel, but he also survived. I think that is one amazing family, and I know you'll agree. It saddens me that the parts of the family grave are now barely legible.